For residents of one of the West Bank's most violent and contested cities, cameras are "one of the most effective weapons we have." The media whirlwind surrounding the Oscar nomination of the documentary 5 Broken Cameras has put the spotlight on film as a tool for social justice in Palestine. In the film, Palestinian farmer and filmmaker Emad Burnat chronicles the struggle against the construction of the “Apartheid Wall” in the West Bank village of Bil’in. He records demonstrations in the village as well as its cultural and social gatherings. Throughout the course of filming the movie, Israeli security forces break five of Burnat’s cameras. 5 Broken Cameras is one more step in the ongoing global effort to raise awareness about the Israeli occupation. But another video released last year to much less fanfare had a very tangible impact on one family. Thanks to footage posted online under the title “isreali (sic) army tortured a woman,” Abdelrahaman Salayma is not in jail. The video was shot in Hebron (also known by its Arabic name, Khalil), a city divided into two sections under a system Israel calls the “separation policy.” This ancient and vibrant city, a center of industry in the West Bank, has become one of the most troubled examples of life under Israeli occupation. The area known as H2 is under full Israeli military control, and access is highly restricted for Palestinians. All Palestinian shops in H2 were closed by the Israeli military following the 1994 massacre of 29 Palestinians by Israeli settler Baruch Goldstein. Palestinians are barred from living in most H2 areas. H1, on the other hand, is under Palestinian Authority control. In Hebron’s historic old city, H1 runs right alongside H2. About 500 ultra-Zionist settlers live in H2, and the Israeli government provides as many as 2,000 soldiers to protect them. Many of these settlers live next door to Palestinians, and some Palestinian homes have had their front doors welded shut by the military, forcing the residents to enter through windows accessible only from the roof. The old city is also the center of settler violence in Hebron. Especially vulnerable are those, like Abdulrahaman Salayma, who live near the Tel Rumeida settlement. The Palestinians in the area are subjected to frequent attacks by both settlers and soldiers. Settlers habitually throw rocks and fists at Palestinians — and, in one particularly extreme case, a washing machine. Soldiers enter homes for random night raids, terrorizing the residents and searching through their belongings. The soldiers told Salayma to get dressed because he was under arrest. His mother began screaming at the soldiers to let her son go. At this point, someone in his family started filming. In the video, Salayma’s mother can be seen screaming at the soldiers as they drag her violently from the house. She falls to the ground and is picked up by the soldiers before being taken to jail along with her son. “They kept her in jail four days. Thirteen soldiers went to court and said she hit them,” Salayma said. But Salayma’s family had the video. Issa Amro is the director of Youth Against Settlements, the group that posted the video on YouTube. He believes the video alone saved Salayma and his mother from an extended stay in Israeli prison. “If it wasn’t on film, they both could have gone to jail for a long time,” he said. In a tragic twist of fate, video also became an integral element in the story of Salayma’s cousin Mohammad, murdered on his 17th birthday by Israeli border police in Hebron. The border police initially claimed Mohammad had attacked them with what turned out to be a toy gun, but a security-camera video released later puts the lie to their story. Mohammad was empty-handed when he was killed. The footage can’t help Mohammad, but for thousands of people living in Hebron’s old city, video often makes all the difference. Another volunteer with Youth Against Settlements, Sundus Allazeh, told me, “If we want to take a picture or film settlers or soldiers making problems, it helps us a lot.” It produces an immediate change in the aggressors’ behavior. I’ve heard this story over and over again while covering Hebron for the Palestine Monitor. Many of the cameras in Hebron were donated by B’Tselem, an Israeli human-rights organization that maintains an office in the city. Over the last eight years B’Tselem has distributed more than 200 cameras in Gaza and the West Bank, including 40 in Hebron alone. Musa Abu Hashhash, a field worker with B’Tselem, reiterated the effect that cameras have on the behavior of soldiers and settlers. B’Tselem also takes footage to court on behalf of Palestinians arrested unjustly by Israeli security forces. B’Tselem field researcher Manal al-Ja’bari said she provided footage of arrests to the Israeli courts 10 times, and in all but one case the person being detained was released. Despite the notoriously unjust court system Israel uses for Palestinians, the videos provide such hard evidence that the judge is forced to release the prisoners. Although filming in public is unambiguously legal under Israeli law, B’Tselem takes precautionary measures. Its volunteers are given copies of permits authorized by the IDF’s high commander in Hebron, as well as a letter from B’Tselem’s director. They put B’Tselem stickers on the cameras to provide another layer of protection to their volunteers. Buying cameras, however, is expensive. Al-Ja’bari told me there still aren’t enough cameras for everyone who needs them in Hebron, and B’Tselem is forced to distribute them according to levels of need. Abu Hashhash of B’Tselem told me that when the group began operating in Hebron, it often provoked violent reactions from Israeli soldiers. 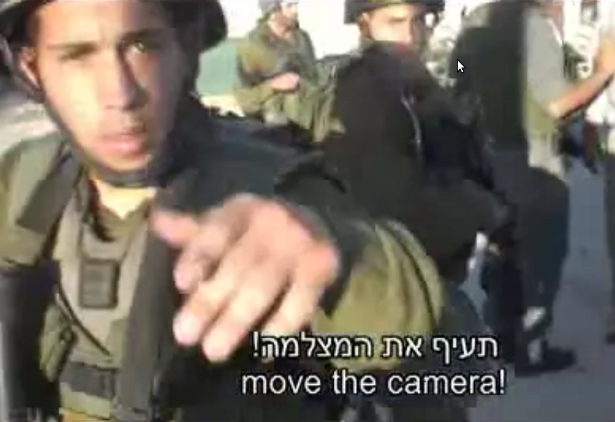 But this has happened less and less often thanks to the refusal of B’Tselem and others to stop filming. The idea of casting a watchful eye on police and security forces isn’t unique to Palestine. In the United States, such “copwatch” programs date back to at least the Black Panthers. Organizations such as Witness continue this tradition today, offering online trainings and producing documentaries based on video testimony collected by members. Witness’ Cameras Everywhere Initiative seeks to build a framework for making effective use of cameras as they become increasingly more ubiquitous in conflict zones around the world.